Silver Gray Glass Dragon Eyes Fantasy Art Dolls Taxidermy Sculptures or Jewelry Making Crafts Matching Set of 2 (40mm) by Megan's Beaded Designs at Designers Artists. MPN: 579605007-40MM. Hurry! Limited time offer. Offer valid only while supplies last. Featuring unique eye designs, that I created digitally, these cabochons are sure to make your creations a hit! Perfect for doll or jewelry making. Featuring unique eye designs, that I created digitally, these cabochons are sure to make your creations a hit! Perfect for doll or jewelry making. Made with high quality print-out of my digital design, and attached to a glass cabochon dome with diamond glaze resin. This listing is for a pair of eyes. Reflections on the cabochons are from the lighting, there are none in the actual eye design. Designed and created by Megan's Beaded Designs. Set of 2 fantasy inspired handmade glass eye cabochons for jewelry making, doll sculptures, taxidermy, scrap booking, and more. Add depth and character to your handmade projects with these enchanting glass eyes! 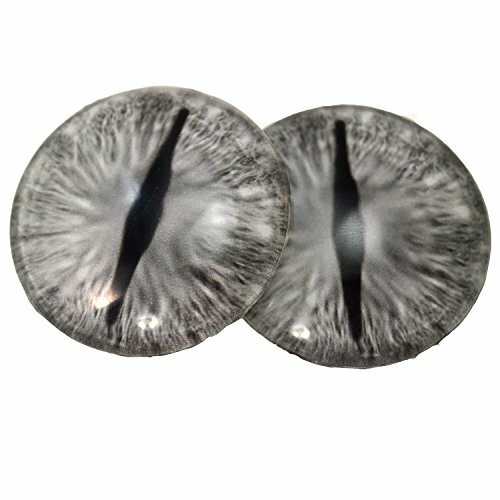 These original, silver colored, gray dragon glass eyes are mesmerizing to look upon. Flatback glass eye cabochons hand constructed with cardstock, diamond glaze, and domed glass.